Clearly the bearded young man at the front of the check-in line had been there for a while by the time Dave and I arrived. With his feet planted a full stride apart, shoulders hunched, and elbows on the desk, he looked discouraged. It didn’t appear he was going anywhere anytime soon. Equally discouraging was the cloud of annoyance emanating from the next person in line, a woman whose frizzy blond hair seemed a physical manifestation of her frazzled state. These two, in turn, were discouraging for the rest of us who had hoped for a speedy room assignment. Eventually the line dispersed and Dave and I wheeled our bags to the desk and gave our names to the receptionist, grateful we had confirmed reservations, confident we would soon be sipping wine in the hotel restaurant. Ack. Never a good sign when excessive scrolling and staring occurs. “Might you have registered under a different name?” No, but we gave mine anyway hoping “Eleanor” might serve where “David” failed. It did not. Nor did the printed confirmation my husband had had the forethought to bring. Ultimately, we booked the room anew and had greater success rectifying whatever glitch there was from our room, by phone, with the help of a young woman in Singapore. Honest to God. But, no worries! We had a bed and we’d be on our way to Portland, Oregon the next morning after a night at the airport hotel. Time for a drink and dinner before turning in early. Oh no. Two women at the table next to us rose, told the server they’d return, and followed the young man. Dave and I drifted to the door for a peek through the floor- to-ceiling glass windows - What’s going on? How can we help? In this, we could not, but the police arrived with an ambulance soon after. Once we returned to our seats, word filtered back to the restaurant that the kid had overdosed and it didn’t look good. Our table offered a view of the bar and its wall-sized TV. Outlandish costumes, vivid colors, and bizarre settings filled the screen as the Cheshire cat grinned at the Mad Hatter, Johnny Depp, in pancake make-up and flaming red hair. Alice in Wonderland. Hmmm. Curiouser and curiouser. Our meals were delicious. I’d ordered a Szechuan wok with tofu and vegetables, and Dave, pasta with marinara sauce. The mood in the restaurant was companionable but sober over our shared concern about the crisis unfolding outside, and I fear I was poor company given my mesmerizing view of the escapades of Alice. Suddenly Dave said, “It’s really hot in here and I’m super tired.” Actually, it wasn’t hot in there, and Dave felt funny. Maybe I’m too suggestible, but I began to feel funny too. Odd given our tasty and uncomplicated meals. We paid up, thanked our server, and beat a hasty retreat to our room. Luckily, the bathroom was clean and well stocked with all necessary provisions. So, first night on our way west: mixed reviews. When feeling bluesy, many would whip up a pie or cupcakes to answer that inner call for comfort. Not me. When bored as a teenager, I’d mix brownies or chocolate chip cookies to pass the time, but baking was never my passion. While occasionally I’ll bake a Happy Winter Fudge Cake or the Decadent Chocolate Cake in the Silver Palette Cookbook, since sugar was deemed poison – curse that science! - I don’t make them often. Still, it’s blissful when heavenly aromas waft from the oven, and something delicious is rising and turning golden brown. But when I’m upended, I don’t reach for a whisk. For insight and peace, I turn to writing, woods walks, prayer, and self-help books. Lately, the world is chaotic, and that spins me. My traditional methods help, but our daughter introduced Dave and me to a wonderful new pacifier. 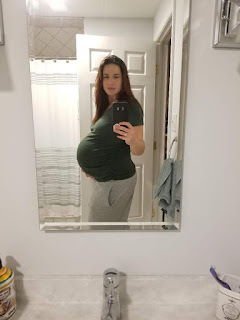 In the final weeks of her pregnancy, Casey was impressively ponderous and had energy for little other than what could be undertaken from a couch. Her friend Lindsay directed her to “The Great British Baking Show,” and she was hooked. “It’s so relaxing,” she told us, a moony baby sloth smile lighting her face. For years, Chopped was our cooking show of choice. We still enjoy it, although I never liked the posturing and bravado of the professional chefs competing for the $10,000 prize and boasting rights. The pace of the show is intense as contestants vie to produce flavorful, creative dishes while squeezed for time. In contrast, as The Great British Baking Show opens, we viewers wing with the camera over sweeping bucolic scenes of the manor house, grounds, and voluminous white tent that houses the competition. We bank and descend over sheep grazing in emerald meadows dotted with swaying buttercups. Between challenges, we sit with contestants beside the river or in front of a garden. We zoom in on pastel spring tulips and yellow daffodils, or a dewdrop clinging to a blade of grass. We join the judges, Mary Berry and Paul Hollywood, in their small tent for a cup of tea as they taste various bakes and discuss the bakers’ progress. And every word rolls lyrically, those lovely English accents sonorous and soothing. The clench in my stomach eases; my racing mind slows. Now, Dave and I spend many evenings unwinding with our new friends Mel and Sue, the presenters; Paul and Mary; and twelve initial contestants seeking, each season, to distinguish themselves. Mel and Sue are charming and witty, gleefully slinging innuendos about pinching buns, the comparative size of baguettes, and the sauciness of self-saucing puddings. Paul can be harsh, an arrogant jerk, but contestants yearn for his praise, a softening in those steely blue eyes, and his sought-after handshake. “Don’t pay much mind to the pouty silverback,” Sue quips when a contestant slinks back to her seat after Paul decrees her entry “Awful. Raw” after poking his finger into the cake she’s spent four hours baking and decorating with intricate fondant rosettes. Mary Berry, a beloved veteran baker, is forthright in her comments, but like any good teacher, finds something to compliment, particularly if she feels Paul has been unkind. “But your fondant work is lovely,” she might add. As the competition proceeds, the howling of the world fades as our bakers pursue the perfect patisserie; stunning, flavorful breads; heavenly fillings; and spectacular cakes. In the first show of each season, Dave and I scan the line-up of hopefuls as they walk across the lawn to enter the tent. They always seem a sorry bunch; we’ve come to know the previous season’s players and we miss them. But it doesn’t take long to find our new favorites as the contestants are introduced through quick clips of their families and professions. A sampling of names reflects the range of backgrounds: Nadiya, Nancy, Terry, Benjamina, Tamal, Rav, Andrew, Selasi, Iain, and Ruby. Depending on the season, by the quarterfinals, Dave and I have attachments. We love young Andrew with his red hair and self-conscious grin. He looks like Opie or Howdy Doody; he’s self-effacing and dear; and most of his recipes were “nicked” from his dad or grandma. Nadiya, so far, is my all time favorite. Initially she seemed foreign and subdued in her dark hijab, so separate from my experience. Once I got to know her, she was completely familiar: animated and expressive, emotional and funny, quick to doubt herself, and, when successful, giggly, teary, and exuberant. Don’t we find that to be true most of the time? Given the chance to go beyond appearances, more often than not, there is connection and common ground. Wrapped in cozy blankets on the couch, Dave and I lean forward, breath held, as Paul and Mary evaluate the shine of a mirror glaze, the spring of a sponge cake, or the fluffy marshmallow center and crisp coating on a toasted meringue. We care about their assessment. If one of our favorites is praised or rebuked, we cheer and cry along with them. “I can’t believe I’m crying all the time when I watch this show,” Dave says. Yet we do. What a relief, to lock out concern over a careening nation to weep or exult over brulees, canapés, and eclairs! Of course, it’s not the pastry that has us in tears (although watching a rich chocolate buttercream frosting smoothed over a moist sponge knowing I won’t be served a slice can be torment), it’s our fondness for the people. All of us are represented in the students, ministers, doctors, farmers, teachers, professionals, retirees, and stay-at-home mothers who compete; in their diverse religions, colors, ages, and sexual orientation; in their hijabs and housecoats, turbans, wrinkles, piercings, and tattoos. To all appearances, in the Baking Show tent, such differences fold together as easily as the eggs, butter, sugar, chocolate, and flour so essential to my delicious Decadent Chocolate Cake. We identify with our on-screen friends in their wish to excel, bouts of self-doubt, and exhalations of relief. And when a berry-sweet Charlotte Russe or spectacular gingerbread dragon prompts Paul’s grin and Mary’s “sheer perfection!” Dave and I beam in sharing the baker’s pride, light as an airy souffle. Like Dave, a contestant once wiped her tears and said, “ I can’t believe I’m crying over eclairs, but I can’t help it.” They all know this is about bread sticks, roulades, custards, and pastries, not saving the world. But it IS about testing skills, resilience, calm under stress, learning from mistakes, and striving to be best without losing empathy for those around you. I once read that in celebrating others’ joys, you make them your own, and the Great British Baking Show gives us weekly doses of vicarious joy. Each episode covers three separate challenges in the space of a weekend over the ten-week season. In that stretch (condensed thanks to Netflix), we become fond of the contestants, and they become fond of each other. Paul might be harsh in his comments sometimes, but the bakers themselves seem a team more than competitors. When the walls of Louisa’s gingerbread church tumbled, three of her opponents rushed to help prop them. When Kate ran out of time before starting her glaze, Richard grabbed a pot and spoon and said, “What do you need?” My heart melts like chocolate at these many small kindnesses. On the last day, former contestants, friends, and family of the three finalists gather on the grounds for a festival of games, food, and celebration as they await announcement of the winner. To cheers and applause, the bakers emerge from the tent bearing their showstopper entries to be enthusiastically consumed by all. Soon after, Paul, Mary, Sue, and Mel join them, barely visible behind three massive bouquets. After weeks of striving, the winner earns flowers, a cake stand, and affirmation; no prize money is given. Bestowed instead is a glorious sense of achievement in being, until next season, Britain’s Best Amateur Baker. Dave and I beam with pride, then slump a bit, for we’ll miss our friends from that series. Absolutely. Time to meet a new slew of friends. The tiny sticker on the underside of the silver pitcher reads “15.” Somewhere, in one of the bins and boxes from my parents’ home that have migrated to our attic, is the list of Mom and Dad’s wedding presents. If I wished, I could search out that list, flip through the pages, run my finger down to #15, and find the gift-giver. Mom gave me the pitcher just months before she felt sick. 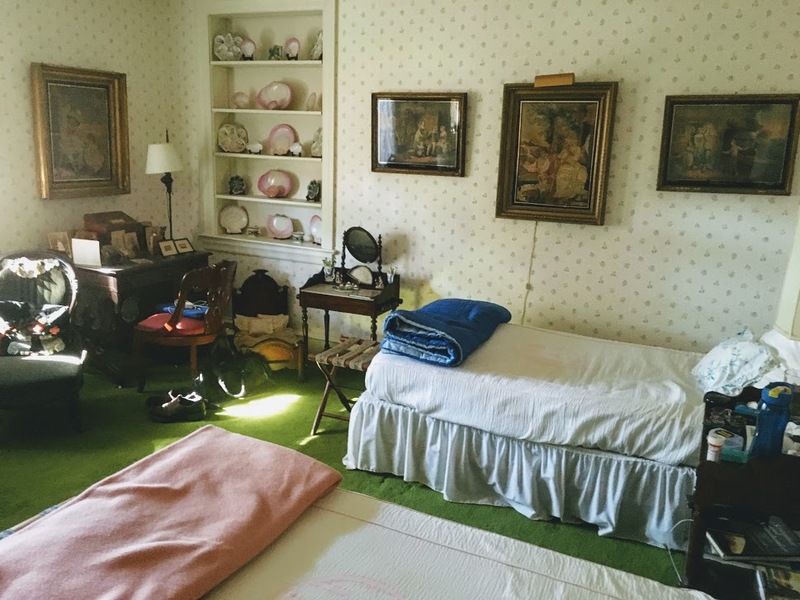 For a while she’d been trying to whittle down the belongings accumulated over fifty-five years lived in the house. She’d opened the kitchen cupboard and waved toward four pitchers on the shelf, saying, “Take one if you want.” Silver is not the usual in our rustic, 1782 home, but I really liked this graceful remnant from an elegant era. When I noticed the “15” on the bottom of the pitcher as it dried upside-down in the dish rack, my nose prickled in imagining the wrapped gift arriving at Mom’s childhood home, 12 Upper Ladue, sometime in the fall of 1951. Since Mom passed, I’ve come to know her young self far better through her letters. My father was stationed in Germany and Mimi wrote to “My Dearest Darling Paul” every day. She was nineteen years old and missed her man fiercely. She yearned for marriage and a time when they could be together, but everything was uncertain, threatened by the possibility of Paul’s deployment to Korea. In letters to his father, Paul spoke of his loneliness and fear that “this troubled world” and deployment might prevent a future with Mimi. He was only twenty-two. A boy far from home at Christmas… and in reading his letters, my heart ached for that lonely, young guy who became my father. Their handwriting, so familiar to me, appears fresh on the page. Despite sixty-five years stored in a cardboard box, the blue stationary has held its color. 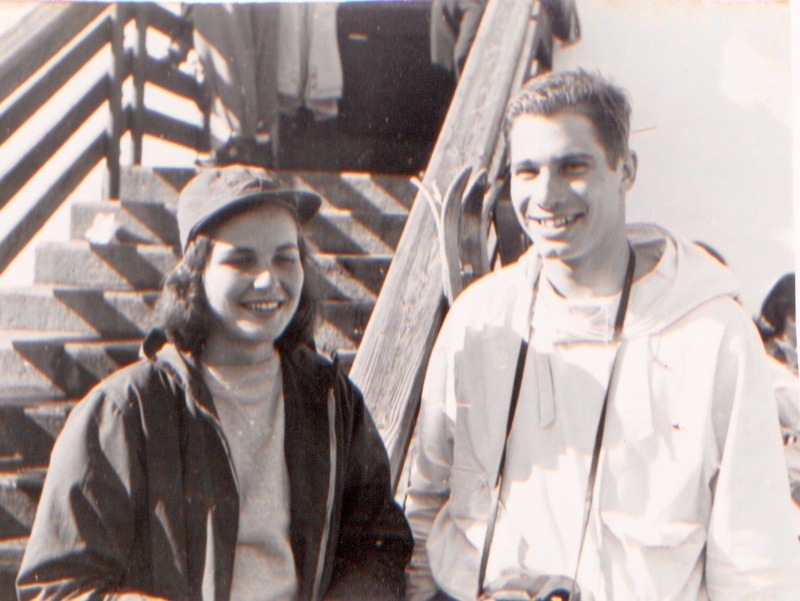 I know how life turned out for Paul and Mimi: they married, had three (wonderful) daughters, four cherished grandchildren, lifelong friends, travels, careers, and collections. And with their pitcher in my hand, my eyes fill to think that it all lay before them when first Mimi opened that package and unfolded the white tissue within. Now that my mother’s life has ended and I have moved into the matriarch phase she just left, I am acutely conscious of the passage of time, and each generation making way for the next. As Dave and I decorated the house, changed bed sheets, put up the tree, and wrapped gifts, I recalled the aura of past Christmases at my grandparents’ homes: candles flickering, flaming plum pudding, stiff needlepoint chairs, fancy dress, and the expectation that kids keep a low profile. When my grandmother died and Mom took over, my grandmother’s candelabra found its place on my parents’ dining room table, and the needlepoint chairs, around it. The plum pudding was dramatic, but never tasted as good as it promised to be, so my brother-in-law’s silky fudge and rum sauce over ice cream replaced it. And the children? Far from low profile, they became the focus. Still, those homes of the past made us feel cherished and safe; Dave and I hold the grandparent title now, and strive to embrace our kids and their families in those same ways… minus the plum pudding and finger-to-lips admonitions to behave. When my sisters and I divided the contents of my parents’ home, I did not clamor for the needlepoint chairs or the candelabra, and certainly, none of us wanted Mom’s white plastic kitchen chairs, but I really wanted the dry sink in the den. It was the first piece of furniture Mom and Dad bought together, and I loved its heavy, primitive look. Plus, it is scarred with a twisting groove that teenaged Lea idly carved with an ice pick while talking on the phone with friends. Since our marriage in 1975, Dave and I have been doing an every-other-year rotation between the Sylvestros and Ingersolls for the holidays, and this would have been a year with Mom. 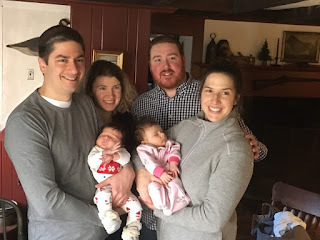 When we discussed what the new plan might be, our new grand daughter Lexi was just weeks old and Eleanor was still afloat in Casey’s belly, so it made sense to hold Christmas at our house in Connecticut. My sisters, Rita and Francie, and their families, were willing to make the trip and stay minutes away at the humble, but reasonably comfortable, Hotel Hi-Ho. For years, the Hi-Ho, conveniently perched on a slope just above the Merritt Parkway, was rumored to have been a trysting destination, a pay-by-the-hour sort of spot. While its huge, red, neon sign was easily visible to cars whizzing by, more often than not one, two, or three letters were out of order. So the “HO_EL HI- _O” was a local joke until recent renovations spruced it up. Tucker, Lisa, Paul, and Lexi would stay with us, while Casey, PJ and Eleanor live nearby. In the week before Christmas, Dave and I attacked detailed To-Do lists each day. As has been tradition since first we were married, Dave rolled out his homemade lasagna noodles, simmered the sauce, and assembled two huge casseroles. I baked “Happy Winter” fudge cakes and made crepes. We shopped for non-perishables on Monday the 18thand perishables on the 22nd. Mixed up artichoke dip and blanched crudité on the 23rd. Ordered window shades for the guest room and crossed our fingers they’d ship in time... They did not. The dishwasher was crammed with the detritus of those preparations. Mixing bowls, plates, ladles, and spoons. Measuring cups, spatulas, dishes, and mugs. “Hon? Be sure to run the dishwasher before you come to bed, will you?” I said on the evening of the 22nd. “Not filling?” I said, or whatever garbled response might have emerged through the toothpaste. Ah well. As my sister Rita said, plenty of bonding at the sink. Plus, she’s a party diva and after my desperate call, she arrived with bags of paper goods. Would my grandmother have tolerated such a substitution? Maybe not, but Mom would have welcomed it. Were they there, Mom and Dad? Beyond the toasts, tales, memories, and love? 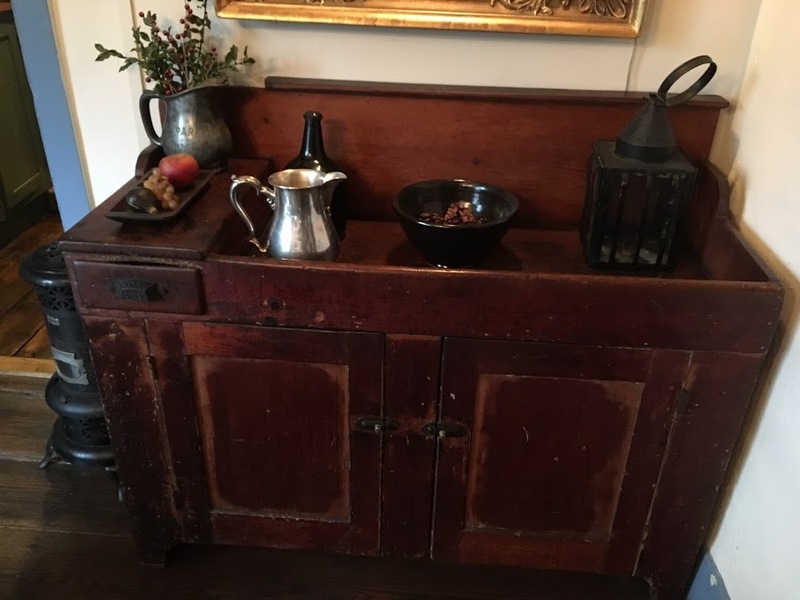 Beyond their touch on the pitcher and wooden dry sink? Beyond their names carried on in their great-grandchildren, Eleanor and Paul? After he died, Dad arranged a bounty of signs to let us know he was still around, while Mom kept her peace when she passed. But I have to think they could not have resisted a Christmas visit to see Jared and Campbell - now men in their twenties - on the floor playing cars with little Paul. To see Tucker and Casey, holding each other’s babies. 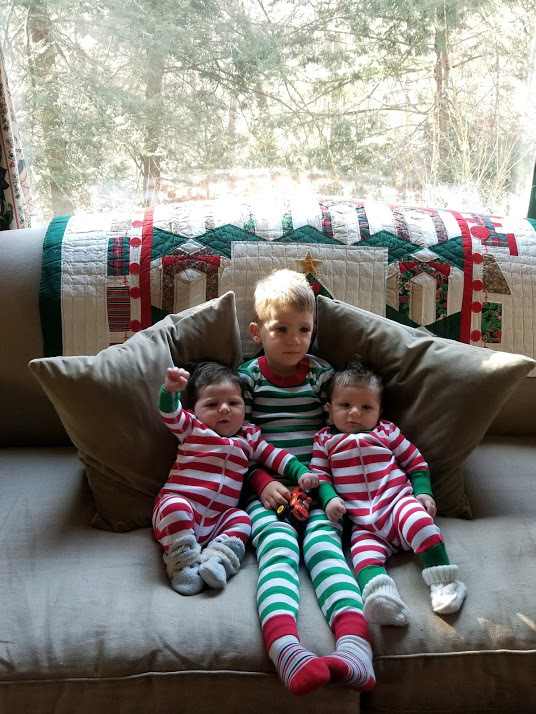 To see three elfin great-grandchildren in matching pajamas, and little Eleanor, already an activist, pumping her fist in the air. 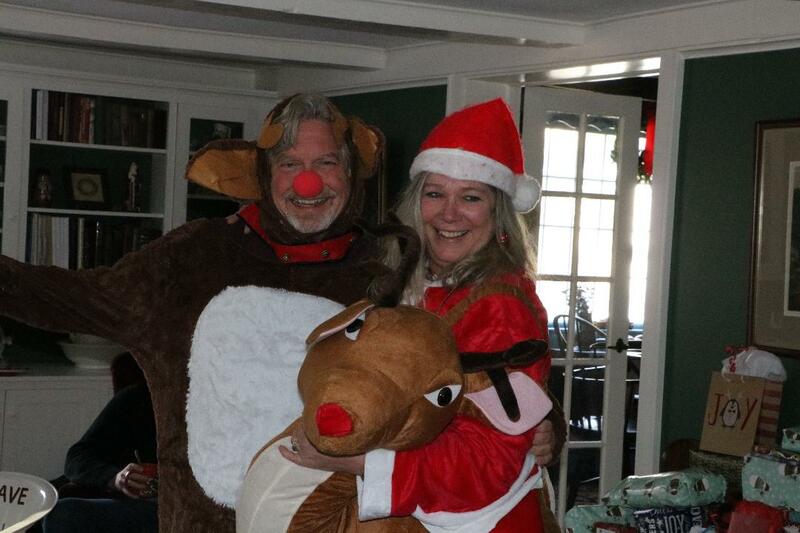 To see Bill and Rita prancing in Santa and reindeer outfits. 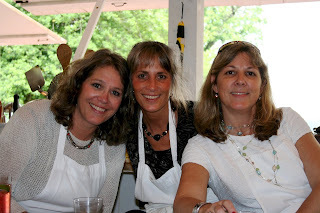 To see my sisters, giggling all the way, smuggling in two of Mom’s sheet-shrouded white plastic kitchen chairs. Yeah, I have to think they showed up. Default suggestions and corrections are often frustrating and sometimes humorous. I supply plenty of material because I’m the worst typist ever. On my tiny IPhone, I have the excuse that my fingers are too big for that puny keypad. “P” is too close to the edge and more often I hit “O” by mistake. And “M”? Forget it. It’s right next to the delete arrow, so that’s what usually happens. In my enthusiasm, I admit I overuse the word “love,” but almost without fail, “live” is what I tap, turning a buoyant comment into an existential observation. A chorus of audible grunts of disgust always accompanies my typing. On email, I can’t blame defaults, and I tend to overlook the warnings of green wavy underlines. Proofreading is a necessity to be approached with the keen scrutiny of Robert Mueller pursuing a lead. Recently, though, my typo gave birth to an incisive new word. I didn’t catch the typo and Otie made no mention of it in his next email. I happened to see it while reviewing the thread for a quick refresher before writing back a few days later. I had no idea what I’d intended to say, and told him as much. Ah, if only I could bore myself back to sleep! For me, “it’s not the end of the world” leaves plenty of room for post-apocalyptic scenarios that are not the end, but gruesome enough, so that mantra gives me no comfort. It’s usually around 1:16 that my eyes fly open. I go to the bathroom for a quick pee and then snuggle back in bed praying slumber will re-find me. Ha! As if. The hours tick by as I manufacture heated conversations with family, friends, Republican leaders, and Trump himself, working myself into an adrenalin-fueled fury that leaves no room for sleep. Or, hearing my beloved Dave snuffle and snore beside me, I begin with a smile and gratitude, then hustle myself along a spiraling path to tears and what would I do without him? To-Do lists can wrestle sleep to the mat with ease, and a quick mental reminder turns into an exercise in obsessive repetition to make sure I don’t forget whatever pressing task I’ve come up with. Guilt, too, is a rich well of sleeplessness. I can dive in there and swim in that heavy muck for hours. Or, I think of warnings for my children after I’ve read the latest health scare in “The Week.” Thoughtcrimes! Dear Otie is more optimistic than me. In so many words, he said that branding these ruminations “thoughtcrimes” offers the vigilant an opportunity to recognize the thief, seize him by the scruff of the neck, and banish him from the bedroom. My friend closed with this comfort, “When I wake up early and start worrying about something that isn't going to happen and that I can't do anything about anyway, instead of the end of the world thing, I'll quickly dismiss my troubles with, "Thoughtcrimes. Sleeping in will be good." Oh, waiting is cruel. Whether it be for good or ill, for grades, test results, or a child’s Christmas morning extravaganza, waiting is agonizing. And waiting for the birth of a baby? Every month, phase, appointment, and scan holds it’s own particular excitement or worry. 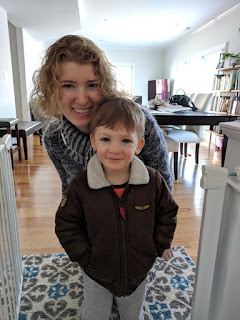 I’d never had to worry my way through a delivery, and as the disquieting number of our “nothing yet” responses mounted, anticipation had turned to concern. Lisa’s labor was long and perilous… but gratefully, ended with the hoped-for results. Lisa would recover and heal, and baby Paul has grown into a captivating little boy. 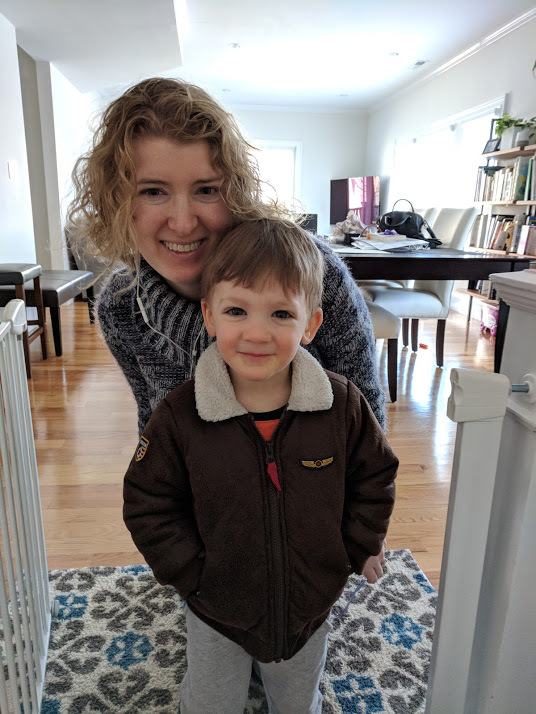 He is smart, curious, and funny, but I admired Lisa’s courage in facing another delivery when we learned she was pregnant again. Mom was still lucid when Tucker whispered that news to her in late February, a secret kept from the rest of us for months longer. At Mom’s memorial service in March, Casey privately told her brother about her own pregnancy, again, a secret from the rest of us for a while, just to be sure. Casey says she made Mom promise, during those final days in Muirfield, to be a guardian for whatever little ones she might spawn, and Mom said, “I’ll watch over all of you…” So, in addition to the image I hold in my heart of a Heavenly Couch reunion, hoping that my belief and reality intersect there, I am counting on Mom to fulfill her promise. 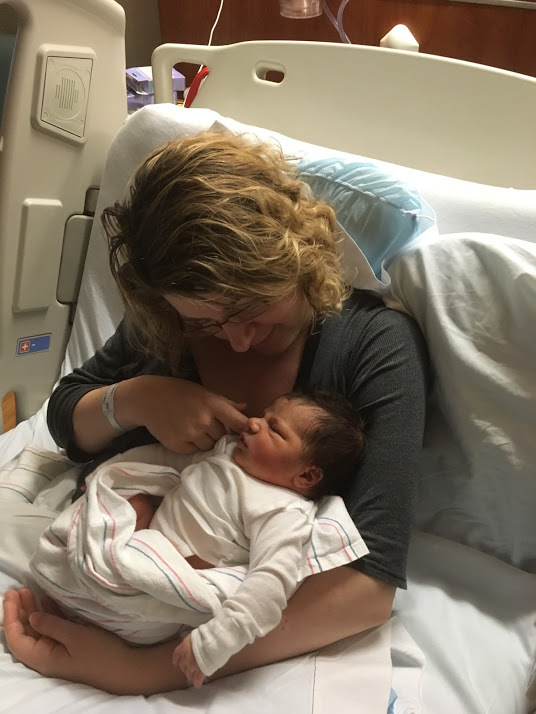 Due to her previous birth experience, Lisa scheduled a C-section in October, and Lexi was born without the hand-wringing anguish of Round One. Three years ago, it was weeks before Lisa felt strong and well. “I feel I missed out on Paul’s infancy,” she says. When Dave and I went to visit two weeks after Lexi’s birth, Lisa insisted on making dinner. To our offers of help and our wish that she relax, she said, “I enjoy this.” She is thrilled and surprised to feel like herself, and have her beautiful baby girl. Possibly. In general, I’ve forgotten a lot. As a Pilates instructor, Casey is in tune with her body, and as her mother, I am in tune with her. As her pregnancy progressed, her ribs felt bruised and painful. I don’t remember feeling anything like that when I was pregnant. Should I worry? When her baby kicked, it hurt. I don’t remember anything like that. Should I worry? During the last month, Casey’s fingers went numb. Whoa. Weird. I definitely don’t remember anything like that. Should I worry? Truth is, I’ve worried a lot. When I was young and my stomach was ballooning, I felt only joy at the baby rolls and kicks within me. Armed with Lamaze training and copious reading, I was raring to go and ready for the birth battle. I wasn’t worried at all. But it’s been a different thing entirely having our two precious girls facing that miraculous, but arduous, journey to produce life. 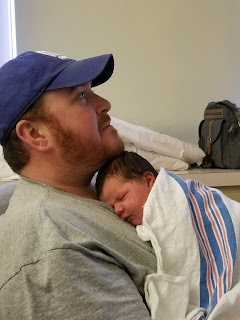 My daughter’s due date came and went. With her stomach huge and ungainly, sitting, lying down, and walking were difficult, leaving few positional options. Throughout her pregnancy, in hearing of others’ scheduled inductions, she’d been resolute in stating, “No one’s taking this biscuit until it’s fully baked!” But as nights passed, sleepless and uncomfortable, she conceded that a scheduled birth had some appeal. For several days, she experienced abdominal tightenings and cramps… were they contractions? At 1:00 AM, in the early hours of Thanksgiving Day, she was pretty sure they were. As they became regular and increased in intensity, she was certain. Then, after six hours, they stalled. Argh. Our nephew, Trevor, and his wife, Lisa, had offered to host Thanksgiving this year since Dave and I had no idea what that day would hold. 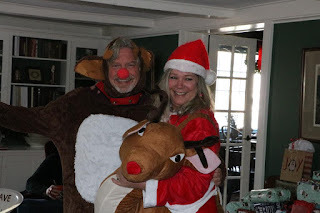 When Casey’s husband, PJ, texted us with news of Casey’s progress, and then, the lack thereof, we wondered what we should do: make merry with the Connecticut Sylvestro clan while our daughter faced the biggest physical challenge of her life, or stay home to worry and stew? It was tempting to text PJ every ten minutes. What restraint we showed in sticking to an every-two-hours communication! Without distraction, we doubted we could hold to that, so we picked up Dave’s mother and headed to Trevor and Lisa’s. It was a lovely afternoon of delicious traditional foods… and full family focus on getting that baby out. Dave decided to make a video to cheer Casey on, and Steve, his brother, composed lyrics to the tune of Happy Birthday. We sang with loving gusto, "Have your baby right now. Have your baby right now. Don't wait til tomorrow... Have your baby right now!" Throughout dinner, we texted PJ periodically… hesitantly, guiltily… knowing he was busy supporting our girl. By late afternoon, Colleen, the doula or birth coach, had arrived and was helping Casey (and PJ) stay calm. Where was a doula to keep me calm? I definitely could’ve used one. Finally, at 9:30, PJ texted that they were on their way to the hospital. Thank God! That gave us license to go too, and at least we could be near our girl in her efforts. The baby would be here soon! PJ’s mother, Janine, who loves our kids as much as we do, was just the right company as the three of us settled in for what would be a very long night. Initially, we shared our wait with an expectant father and his two remarkably well-behaved sons, a toddler and a child of about five. A big-screen TV ran a series of Christmas movies and religious shows, but the sound was on mute and we couldn’t drum up enough interest to figure out how to turn up the volume or change the channel. Every few hours, I allowed myself a walk down the hall to Labor and Delivery to check on my daughter. She was amazing in her bravery and concentration on the work to be done. Dressed in a white johnny bedecked with blue diamonds, and connected to an assortment of wires and monitors, she breathed slowly through contractions. PJ sat by her side holding her hand, and the doula stood at her head, stroking her hair. It was hard to feel so out of place as I remained by the door, my unhelpful hands clasped humbly before me, as Colleen, a woman I’d barely met, stroked my daughter’s hair while murmuring encouragement and tips. I wanted to stroke Casey’s hair and murmur encouragement… but I didn’t know the tips, or the exercises, or what those lines on the monitors meant, and the doula did. What I did know was that the smiley face on the white board was still on the circle that indicated 4 centimeters dilation. Despite 30 hours of labor, that smiley face had not moved. How I longed for an eraser to rid the board of that simpering sign of stalled progress. How could Casey bear to look at it? After each visit, I trudged back to our post with my discouraging report. Dave and Janine would look up hopefully at my entrance, and then shake their heads at my words. Dave would return to his crossword puzzle, Janine to scrolling on her phone. Wisely, I’d brought Robert McCammon’s “Boy’s Life,” a riveting story of a boy’s encounter with mystery, bigotry, and the supernatural. I hoped an escape with twelve year-old Cory might help pass the hours of waiting. The young father and his sons received word of a birth around 3:00 AM and left us. They were soon replaced by two grandmothers, a daughter and grand-daughter who settled in to wait for their loved one to produce. As the hours passed, their numbers grew as more siblings and cousins came to check on progress. In the muted light of early morning, we all wished each other luck, shared cheese and crackers, and were comforted in waiting together. Poor Casey! Several times, PJ emerged to tell us she was fine, but still no change in that 4 cm dilation. The sun rose, and our friend Joanie arrived with pumpkin bread, chocolate covered espresso beans, pomegranate beverages, and cozy socks and fleeces. Sustenance and warmth! Cheese and crackers go only so far. Missy and Paul Sr., PJ’s dad and his girlfriend, joined us, along with a few more cousins of the other family-in-waiting. They were feeling the strain of the passing hours and were aghast to hear how long Casey had been in labor. I was worried, but not about the epidural. I just wanted the baby out, and my girl to be okay. And finally, the 4 cm smiley face was erased, and a large pink heart filled the 8 cm circle. Thank God. The family of grandmothers and cousins had received their happy news and took turns visiting their loved one and her baby. Joanie gave us hugs, sent Casey her best wishes, and headed home. Another expectant dad with his siblings and, again, two remarkably well-behaved small boys, claimed the remaining seats in the room. What wizardry had been used in raising the children that waited with us? And when was our new child going to make her appearance? 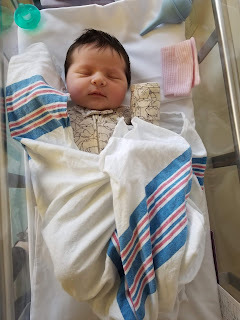 Around 5:30 PM, I returned to Labor and Delivery in time to see a bustle of activity around my daughter. A blue cap placed on her head. A doctor explaining medications and risks. A nurse untangling another IV line and preparing to insert it. PJ standing stock still with his back to me, holding Casey’s hand, unable to look away from his wife. Casey, weepy, her lip trembling, saying to me, “They’re going to do a C-section. Colleen will fill you in. I’m okay; I just can’t talk about it right now.” And she turned away to inhale, exhale, inhale, and exhale. “The baby’s not responding?” Omigod. Dave had left the hospital to feed and walk Casey and PJ’s dog, so it was Janine who saw my stricken expression and rushed to hug me. “They’re doing a C-section. The baby’s not responding, but they assured me it would be okay,” I stammered. Paul Sr. and Missy didn’t speak. Janine and I held each other and sobbed. It would be okay. Casey would be okay. Her little girl would be okay. Of course they would. Thank God for C-sections. But, I knew Casey was scared and distressed. And what about the “not responding” part? “Mom, you promised…” I prayed to my mother and father, to God and my grandparents… to anyone who might be listening and could intercede. Who knows how the Other Side operates? “Then how do you know she’s all right?” I asked, my eyes searching Colleen’s for truth. Dave returned with wine and lemon shrimp risotto, and I filled him in on the C-section. He took a deep breath and said he was relieved. "Actually, I've been hoping they'd make that decision. It's been too long." Elias, an expectant father whose wife was 7 cm dilated, took a break from the labor room and joined us for a glass of wine. The other families had left hours ago. 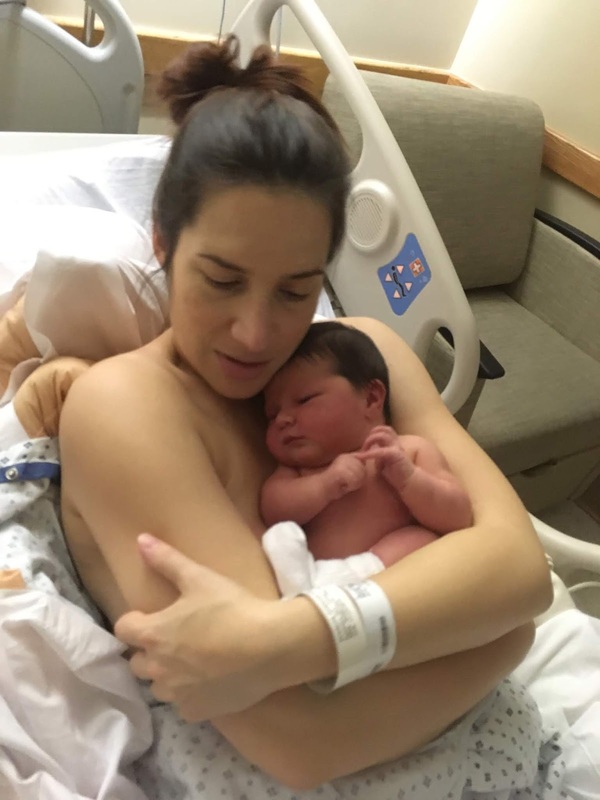 How long do Caesareans usually take? Finally… finally! PJ strode into our midst. “She’s here! Casey’s in repair, but doing fine. You can see her soon. The baby’s beautiful.” He held out his phone and swiped through pictures of an adorable chubby baby with PJ’s cheeks and Casey’s mouth… and a full head of dark hair. 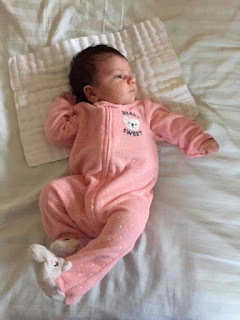 “Mom, I’m waddling,” Casey’s voice on the phone was rueful but good-humored. “Hate to tell you, Sweetie, you’ve been waddling for days,” I replied. With only weeks before her due date, Casey is short of breath, uncomfortable, sleep-deprived, and… waddling. 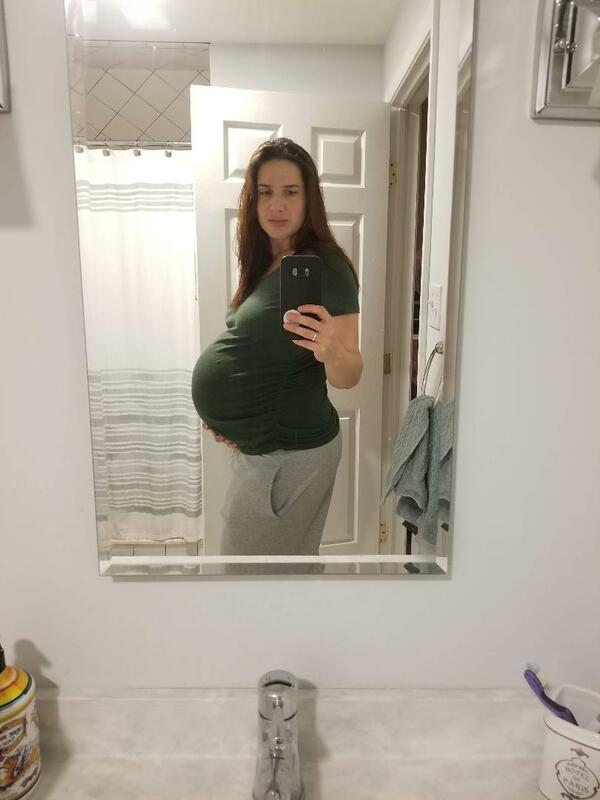 She has kept photo documentation throughout her pregnancy and recently invited me to join a shared album, “Belly Chronicles.” My Lord! The female body is astonishing in it’s ability to stretch to encompass new life. 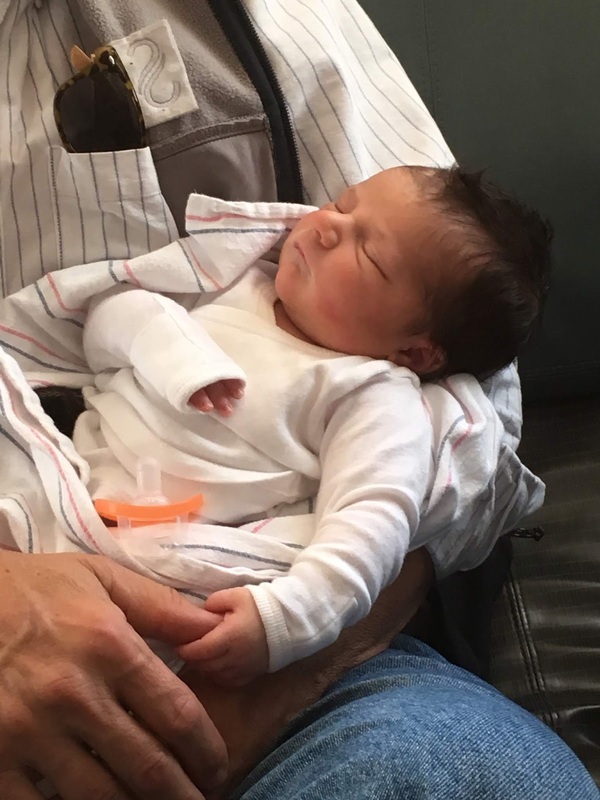 Two weeks ago, the doctor estimated her unborn child’s weight at 8 pounds, 3 ounces. “I just want to meet her,” Casey said with plaintive yearning while stroking her distended stomach. Like bins of photos scanned into one thin, portable disc, this year - with all its richness, sorrow, joy, and anticipation – feels condensed. It wasn’t long ago, mid-January, when Mom confessed to feeling punky. Within a few days, I headed to Philadelphia with my friend, Joan, to visit Mom and attend the Women’s March with my sisters. In the wake of Mom’s diagnosis, the events, exuberance, and power of the march were overshadowed as Mom approached her death with grace and courage. In the weeks that followed, we stepped out of life’s habitual stream into the cocoon of Muirfield. After Mom passed in March, the three hours from Connecticut to Pennsylvania became so routine they seemed to shrink to an easy commute as I drove back and forth to help my sisters sort through the furniture and keepsakes of generations that had come to rest in Mom’s house. During the summer, July held a trip west for us; August, time in Weekapaug. Since then, again, we have been… waiting. 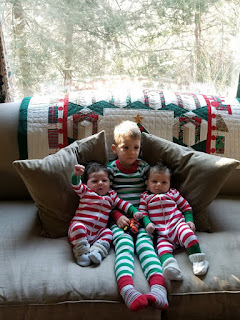 Gratefully, this wait has been one of joy as we have been waiting for… babies! Two weeks ago, Tucker called with news of Lexi’s birth. His voice was happy, loving, and relieved as he reported that Lisa was tired but doing well after delivering their chubby, baby girl. Lisa’s mother, Jan, had flown in the week before, and Dave and I headed north after getting the call. Francie and Matt were in Boston visiting their son Campbell, so they joined us at the hospital as well. Within ten months, two hospitals have been our haven – for such very different reasons - allowing us to retreat and reduce our circle of concern to what matters most: those we love and their well-being. “Oh. Knuckles…” repeated Paul. 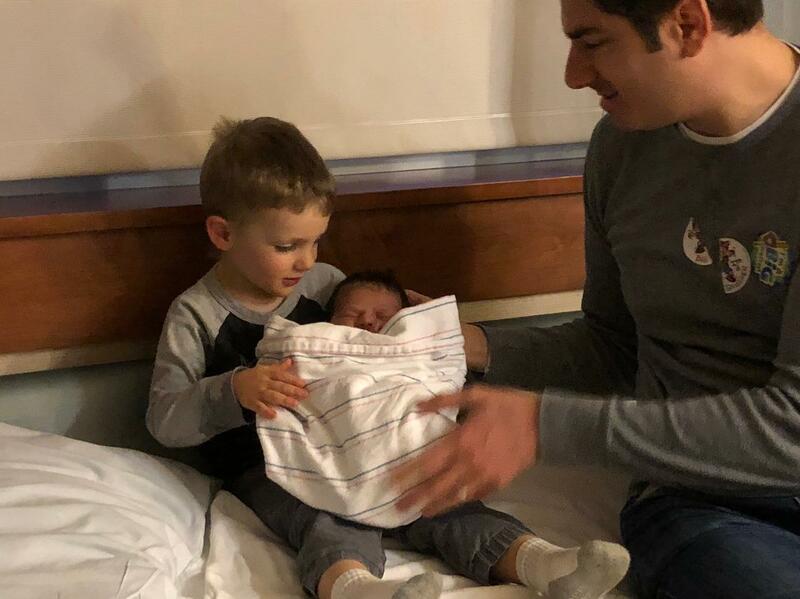 And then, “Okay, I’m done,” he said, eager to have Tucker pick up the baby so he could scramble to the floor and play with his cars. But, yes. Aren’t those tiny knuckles a wonder? I’ve held many babies, and still those tiny hands, fingers, and feet amaze me. 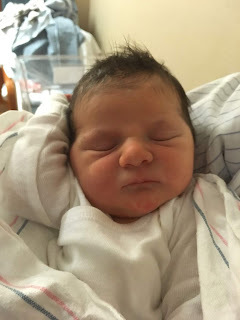 I could gaze for hours at Lexi’s tiny nose and tiny mouth, breathing deep her sweet baby scent, regretting only that while nestled in the crook of my arm she is not close enough to nuzzle her soft, kissable cheeks. And where now, she sleeps and flops loosely over my shoulder, in six months, she’ll be smiling and sitting up on her own. So many surprises, miracles, and potential nestle within this brand-new human. When my kids were little, I wished desperately that their happiness and security would last forever. Maybe it’s because I’m older and know more, but life seems tougher than it was then. Like the sign said, these girls will have to be strong. And their parents are on it. Before long, Tucker and Lisa will start reading to their daughter. Paul has several shelves of books, and his sister will probably love “Curious George,” “The Very Hungry Caterpillar,” and “Click, Clack, Moo” as much as her brother does. Soon, tales of Disney princesses and adventurers will join those selections. A neighbor has already added “Baby Feminists” to their library, so Lexi’s heroes might include Michele Obama, Malala, or Ruth Bader Ginsburg as well as Moana. Today is Rita’s birthday, so, while we want Mom to go as soon as possible because she is unhappy whenever she wakes up and sees she’s still here, we hope she hangs on until tomorrow. Two days ago, not knowing what her situation would be in the days ahead, Mom rallied briefly and sang “Happy Birthday.” Rita listened, her smile wide, her eyes glistening, but we all had to chuckle when Mom wrapped up the song with “Happy Birthday dear Matt….” Ah well. We knew what she meant. Right now, she is snoring softly, thank god, fast asleep. Two days ago, frustrated with what was, to her, a snag in her passing, she keyed into the refrain her doctor, nurses, and Hospice staff have repeated: “You can do whatever you want. You can refuse food and drink.” We have all learned that Morphine does not hasten the end; that common belief has evolved because it’s generally the medication patients are taking at time of death. So, exercising the tiny area over which she still has control, Mom has stopped eating. She has been here at Muirfield for a month… as have we. Dave, Matt, and Bill have been extraordinary in supporting us and keeping everything chugging while we girls stay with Mom. The men have done laundry; run errands; cleaned house; cooked delicious dinners for us… and more. Yesterday, I left Dave asleep at 638 when I headed out to take the morning shift at Muirfield. I clicked the “unlock” button on my car key and… nothing. Must have pushed the wrong button. Tried again. Listened for a hint of an engine purr. Nothing. “Please, oh please...” I begged while stabbing the button about twenty times. No luck. Still nothing. Argh! I love my hybrid C-Max, but she has failed me before, and this was really bad timing. Fighting tears, I stomped back into the house, up the stairs, and woke Dave. “My car’s dead!” I wailed. “Ugh. Bummer. Give me a minute to get dressed. I’ll give you a ride over, then call AAA,” he said. Poor sleepy guy. I knew he’d say that. So many times he has lifted my burden and made my problem, his. He delivered me to Muirfield, and spent the next four hours dealing with multiple glitches, finally getting the car started, and then, with Matt, driving aimlessly for half an hour to make sure it stayed charged. Mom has gone without food or water for five days and has slept most of the time. The nurses and Hospice staff tell us that despite all appearances, Mom can hear us. So Rita reports on her birthday dinner; I vent about my car; Francie reads aloud the inscriptions in cards when they arrive. To give us a break, Dave took the late and early shifts yesterday. He says he loved having time alone with Mom to tell her what she meant to him, things he wished he’d told her sooner… for it has seemed, increasingly, that she is far away. He sidles up close to her head, strokes her hair, and quietly says hello. We all look at each other, wide-eyed. Wow. Wow… She’s still here! Despite what we’ve been told, we haven't really believed she’s heard our whispered love, assurances, and appreciation… but, she has! Dave has returned to Easton, and when not at Muirfield, I am happy here, alone at 638, surrounded by portraits, Persian carpets, needlepoint pillows, and vintage posters: vestiges of my grandparents, great-grandparents, and Mom and Dad. My sisters dislike the musty smell, but I love it. It wraps around me, the scent of family history, and I envision all those lives that led up to mine, and am comforted. When I mount the well-worn, carpeted stairs, I trail my hand along the bannister and then the walls covered with the same paper hung when we first moved in over fifty years ago. “Hello dear house,” I murmur. At the landing outside my parents’ room, I call, “Good night, Mom…” It’s easy, not hard at all, to place her on her bed in her room, her favorite, cozy spot. In the guest room, I wash up, then slip into bed under the crinkly white and pink-monogramed bed covers. My gaze falls, as always, on my great-grandmother’s green velvet rocker and delicate lady’s desk. A needlework picture of a grumpy grandfather and little girl carding the wool of a compliant sheep hangs on the facing wall. For years I have slept here. Even as a teenager, I’d tiptoe down the stairs to this room when my third floor bedroom seemed too dark or too far from Mom and Dad. With Mom soon leaving, and this house no longer mine to come home to, how can I pay attention enough? At 638, Mom is everywhere. Sitting in one of the white plastic kitchen chairs watching Jeopardy or standing before the 1928 Roper stove. Sipping her white zinfandel in the den, surrounded by shelf upon shelf crammed with family pictures. Stretched out on her bed, flipping through People or Majesty magazines… or ear to phone, keeping up with her friends. Oh Mom! Despite all the CAT scans and hospital time, the cards and flowers, the vigil at Muirfield, the wretched days and this long stretch of sleep… it seems a terrible fiction that you won’t be here. Who will recommend books knowing I will like them? Who will be as eager to hear the latest tale of a St. Anthony find? Who will answer the phone at 4997 for a cheery, chatty phone visit? Who will relish, as much as Dave and I do, the latest on our kids and their families? You have to know, Mom, how fortifying this time has been for me, Rita, and Francie together. 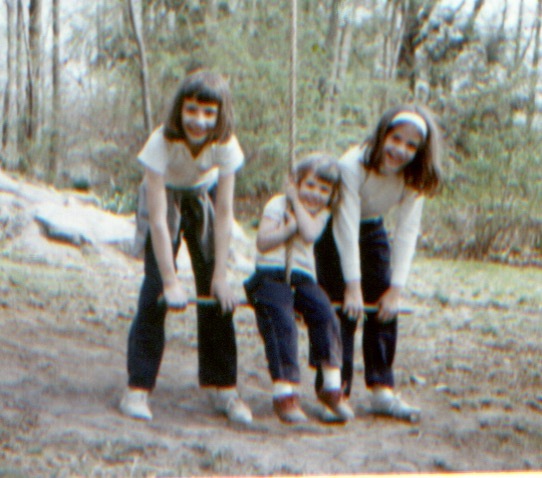 Who would have imagined, after a half century as sisters, that we could get to know each other better? But we have… and they have been stalwart, brave, and dear. I am so grateful for them! I think you must be proud of us… Do you remember what Francie said to you the other day? “We’ll be okay, Mom. We’ll be there for each other as friends and protectors…” And we will.